You can easily mark-up all your products using a percent-based, multiplier or fixed pricing rule! This will reduce the manual labour on your end, and create adequate profit margins for you. The first step is to have a look at all the products that appeal to you. Check the listing price, which is the amount you will have to pay the supplier. Do not forget about the shipping cost, as it is NOT included in the listed price. The second step is to decide the markup that works for the products you viewed before adding them to the Import List. You can create a markup: a percent markup or a fixed markup or a multiplier one. You can add a markup that covers the average shipping cost (if you wish to offer free shipping) and allows for profit. The Fixed Markup adds a fixed amount to the listing price. For example, if the listing price of a product is $10, and you create a fixed markup of $5, the retail price of the product will be set to $15. The Multiplier Markup as the name suggests, multiplies the listing price by whatever number you input in the settings. For example, a product with the listing price of $20 and a multiplier set to 2, will show the retail price of $40. The Percent Markup adds a percent to the listing price to the current listing price. For example, if a product has a listing price of $10, and you create a percentage markup for 50%, the retail price will be $10 + 50% of 10. The retail price will thus, be $15. 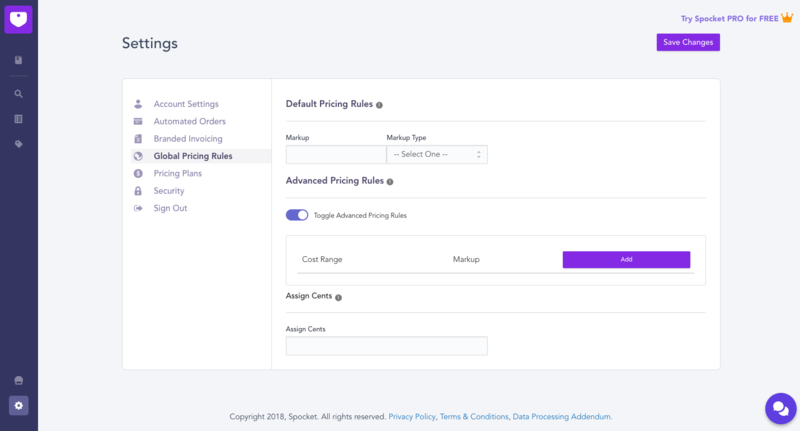 You can create custom ranges for different pricing rules, and assign cents to product costs by using Advanced Pricing Rules! Once you are done, you can start adding products to your Import list. The markups will be visible on the retail price. You can go ahead and do a recheck in the Import list if you want and increase or decrease the prices manually if you wish to! NOTE: Global Pricing rules do not work on products already added to the Import List or Pushed to the store.